Mr. Wurmbrand tells of his imprisonment. He relates with us how he had been beaten so badly that he had not the strength to pray or remember the verses he had memorized, but only to say Jesus, and remain in the presence of Christ. I personally, envy Mr. Wurmbrand for the closeness to Christ that is apparent from his writing. Though he has over twenty wounds on his body, he is more fortunate than many nominal American Christians! The author continues with several stories about the national church, stories of people who even put on the uniform of the secret police to serve the underground church. He tells of their efforts in evangelizing Russians, and soldiers, he tells of how their children gave gospels to Russian soldiers in the open. He tells us of his wife, who preached in front of a worker’s rally and was later taken to prison. Through all of these stories, Richard Wurmbrand relates the struggles of the Underground Church, but still clearly shows us that they are not playing a defensive game, but an offensive one. Mr. Wurmbrand also tells of him ransom, during a ‘thaw’ in the Cold War. He was ransomed from Romania by a Swedish mission. He did not want to leave his work in the country but the Underground Church commissioned him to go and be a voice to the western world. He challenges the West with this book. He tells them to not become complacent. He warns them against falling away when persecution comes. But throughout the entire book, his plea is for the Western world to remember the brothers behind closed countries. To do everything they can to support them and even fight alongside of them in this spiritual battle. 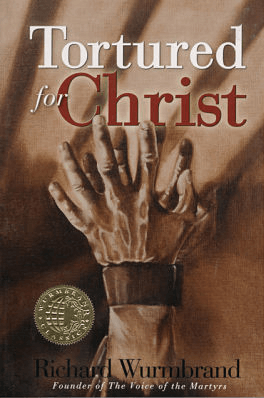 Tortured for Christ is a book that I have decided I will read every year. Though it is old and not so recent, it reminds us of what we must do for the millions of Christians in Romania, China, Eastern Europe, Central Asia, and more places who do not have the freedom to be Christians. I think it is important that we pray for these people and intercede in front of the Father for them! Amazing review, Uriah!! This sounds like an amazing book and I am definitely going to try to find a copy of it. 🙂 Thank you also for encouraging others to pray for these people! Yes, I was very impressed with this book and wish I owned a print copy of it. It is really good. I have a downloaded file from http://www.e-sword.net, if anyone else wants to read the book that’s where you can get it from.